Griffin has descended into the temple through an newly discovered entrance. When he is safely down, Ree follows. A rope is tied off to a statue leading to an opening behind Griffin's cloak hanging against the outside of the temple. A 3' square shaft leads down into darkness. Griffin says, "Okay, let's see if there's anything to see and get out of here quick. Those monsters from before are still around." Griffin searches the room quickly The room is quite large and the light is very dim. A quick search reveals rubble, debris and 2 exits. One to the north and one to the south. The northern entrance is elevated above the room by a few feet. Several steps lead up to it from the left side. Griffin says "Let's check out this way first, Ree.” as he heads to the northern exit. He sees a wide, arched hallway leading north a short distance then turns right and terminates in two large double doors. Griffin turns around. "Let's check the southern exit now"
The room to the south is up a few wide steps. There is much rubble on the ground in here as well. It seems to have suffered much damage from the event that damaged the rest of the temple. Ree stays just behind Griffin, a few steps back, watching. Griffin moves forward slowly and quietly. Ariadne says "So where are we in relation to the area we searched before?" Griffin assumes they are are just to the left of the main temple are you explored before. There were some hallways that led off to the east and west that ended in double doors that were never explored. Griffin explains, "I think we're in that area to the west." Griffin explores the area to the south, checking for any exits in that direction. Griffin moves around the next room. It is about 15 feet across and 50 feet wide. It looks like quite a bit of wooden furniture used to line the walls of this room but it has all been smashed by falling bricks and rock from the walls. Griffin does not see any exits from this chamber. “Ree, keep your eyes out for anything magical, okay?" asks Griffin. Ariadne nods. Griffin continues, "Okay, so we have another way in if we need it. Things look quiet here for now. We should head back up and check in with others.” Griffin makes his way back to the rope. "Ladies first," he says to Ree. Ariadne says "ok" and grabs the rope and climbs back up and succeeds! Griffin follows Ree up the rope. Meanwhile, back up above, Iris heads toward the cloak and says, "Those two are very resourceful," and shoots Remar a warning glare. She crouches next to the covered entrance and readies herself to help should the two within need it. Nearby, Draven checks his holy symbol, makes sure his gear is all in place. He says in an exasperated tone, "Why do I have the strange feeling we're going to be rushing to the rescue momentarily?" But then, almost as if on cue, Ree and Griffin emerge from behind the cloak. Draven asks, "So, you didn't happen to find what we were looking for down there, did you? Save us all a lot of bother if you did..."
Griffin shakes his head. "Nope, pretty bare. But we have another way in when we want it." Griffin and Ree explain what they found. Draven says, "So we have a possible alternate entrance that seems freer of unholy dead at least"
Remar considers this information and inquiries, "Was the door hot? It was real fire in the pit from before and it was hot" but neither Griffin nor Ree had touched the door. Griffin changes the subject and says, "So no movement from the east?" Remar says, "No movement that I've seen. You, Kasiex?" There has been no additional activity in the direction of Ronkan. Smoke can still be seen coming from chimneys and sentries can still be seen on the walls. No on has come or gone from the village. Kasiex says "What if they are not coming out? We could be looking for what we need to complete the ritual"
Iris says, "He's got a good point; we could always leave a lookout up here and poke around quietly and carefully downstairs" Remar blushes. Iris whispers harshly, "Oh for goodness' sake, Remar!" Draven adds, "I was beginning to think the same thing. There'd likely be plenty of time to reorient towards the threat from Ronkan if our sentry alerts us." Griffin shrugs. "Okay, let's go. I was thinking that, but didn't want to override the plan." Remar looks at Iris and capitulates, "Sorry, I can't get it out of my head now! Anything said..."
Kasiex says "What is so hard for you ?" Remar says, "It's...um...nothing. It's nothing. Iris shakes her head. "Let's just proceed"
Remar looks at Kasiex. Kasiex says "You all go down. I will remain here and watch." Griffin says "Remar, do you want to go down first?" Draven interjects, "I can levitate down. I think I have the brighter light, as well, to make it safer for those who'd follow..."
Remar says, "What's our plan if things go awry...again and we start to get over run down there. Ree says "Griffin is the only one that can't fly on his own. I'll take care of him first before dealing with me." Remar eyes glaze over a little. Ree says "What?" Griffin says sheepishly, ""Aw shucks,. How 'bout you cast it on you first, while I get all defensive -like, then we both leave"
Ree shrugs, "Sound good? Let's go!" With that, Draven floats down the hole followed by Ree and Griffin. Griffin and Ree slide back down the rope and quickly checks the area as the others descend. Draven holds his holy symbol out to illuminate the whole of the space like day. Iris dusts her hands on her clothes and says, "I'm going to climb" The young woman trips as she reaches for the rope and goes headfirst into the shaft! Her echoing scream sends Remar into action. The young mage quickly casts a spell on the falling Iris. Just as she emerges from the the bottom of the shaft, she stops in a sudden jerking motion. Iris chokes off her scream and giggles nervously in mid-air, hovering magically. Iris says, "Ah, thanks, whoever got me" as she floats slowly to the floor. An echoey reply from Remar, "No Problem, Iris. I had my eyes on your...you the whole time!" is heard from the shaft. 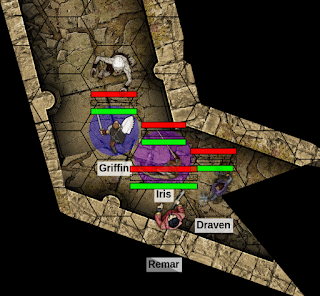 A look of chagrin flits across Iris' face and she whispers, begrudgingly, "Thanks, Remar...I owe you"
Draven help Iris to right herself after her near disaster as the shaken Thyatian reaches the floor. Ree says "I think Draven was going to try to catch you... with one arm." Remar then casts a spell and floats down gently, leaving the Hutaakan Wildsteward to keep watch. Draven says, "Based on where we came in, where is the main chamber from here, Griffin? I trust your sense of direction best, I think..."
The room is as Griffin described it. large and rubble filled. Griffin says "Okay, let's give a little more thorough check-over for this room and then head north"
Griffin says "Okay, let's give a little more thorough checkover for this room and then head north"
Griffin instructs his companions, "Spread out"
Iris says quietly, "I can help look around. I'll watch my step better this time"
Griffin mutters under his breath,"I would hope so"
Draven checks to the south, paying close attention to where he puts his feet. Ree says "Is there any magic that can help us find something like this altar bowl?" Griffin looks to Remar and Iris. Ree says "I can sharpen your vision with a spell. That might help." Draven shares, "I know a spell to find people or things... but I'm not sure I know what we're after well enough to know how to cast it." Ree 's jaw drops and she says "You have magic that can find things? We're looking for something." Draven says, "How well can you describe the thing we're after, though, Ree? Were it a person, I'd need to have met them first, to know what they look like. For an object, I'm just not sure how much detail I'd need." Iris asks timidly, "Has uh, has Golthar ever stolen anything from you, Draven?" Not hearing her question, Draven continues, "Look, it can't hurt to try. I have another option that I can try if the first doesn't work out." Draven finds a relatively clear spot and sits down to clear his head. Draven speaks, to himself. "a bowl, a ceremonial bowl, a profane ceremonial bowl" he mutters. After a second, Draven lurches to his feet! And rushes into the room to the south. He moves across the room to the far end of the space and laughs. Draven says "It's literally right behind this wall!" He continues excitedly, "There is a narrow tunnel behind here. It's only about 20 yards away at best." There is no visible door or opening on the wall that Draven is looking at. Griffin rushes over and starts looking for some sort of secret door. Iris helps them search the wall. After about 5 minutes searching on the wall, Draven finds a tiny slit in the wall, slips his finger in and manipulates a small mechanism. An entire section of the bricks seem to pop out of place. Draven exclaims, "Oho! What have we here?" Iris blurts out excitedly, "Great job, Draven!" "Great job Draven. It's like you've been hanging around with Griffin and it shows!" says Remar, looking up from his resting spot in the archway between the two chambers. Draven says, beaming, "Right, well, I'm stepping aside and letting the people who know from traps and mechanisms to step in now..."
Griffin does his thing. After just another moment, Griffin has shifted the stone wall, which is cleverly counter-balanced somehow, to reveal a 2 foot wide passage leading out to a slightly wider hallway beyond that angles off to the right. Ree says "I'll stay back here and listen for Kasiex"
Studying the secret passageway, Remar whispers, “Appears this curves up toward where those 'others' we encountered were coming from"
Griffin moves slowly and quietly up the passage. The passage is narrow and dusty. The light of the many glowing magical items fills it with light though. Iris whispers, "If you like, I can silence all sounds around us. Would be a problem for spoken spells though"
Griffin whispers, "And would we also not be able to hear?” Iris nods at Griffin’s question. Iris whispers, "Though now that I think on it, the area of silence won't move with us though"
It looks like this passage has been undisturbed for quite some time.” Iris adds, "If you need to do anything noisy, keep it in mind and I'll be ready"
Griffin whispers, "Then perhaps not? Conserve your magical powers." Remar whispers "It's ancient in here. If there were traps they'd be hidden in all this dust and webs." Draven intones, "I've got one more option I can try. The all-seeing eyes of justice are rarely fooled by secrets and traps. If you think it's likely this passage is dangerous, I can ask the gods for the blessing of their sight to lay secrets bare." "Do you see anything suspicious, Griffin?" Remar asks. Griffin tips his head sideways. "Not yet. Didn't get this far before." Griffin examines the path forward for traps and tricks but does not detect any traps or tricks and states, "Looks clear to me"
Griffin says cheerfully, "Well, there's a bowl. You want I should go get it? Looks like the tunnel gets a little unstable around there." Iris returns her gaze downward and studies the plate armor from a distance but it is not of any particular kind that she recognizes. Just then, the body starts to move and everyone hears the scrape of metal on stone as it cranes its neck around to look at you. Iris starts and takes a quick inhalation of dusty air. The undead face of a Hutaakan wight stares directly at Iris, or at least she imagines it is staring at her. Iris' fingertips unconsciously brush across her cheek. Draven retorts, "I think that answers that..." The thing leaps to its feet with surprising quickness and lets out an unholy wail. At nearly the same time, Griffin says, "Do you have to ask, Remar?" 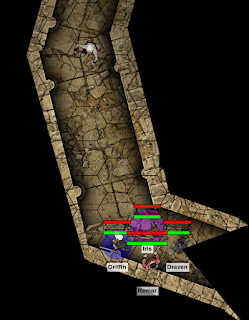 The Wight lurches to the side, barely dodging Remar’s magical bolt. The wight screams again and flings the bowl down the hallway toward the Company. It bounces about 5 feet in front of Griffin, making a loud clanging noise as it skitters across the floor and hits him in the leg. Then it rushes forward, claws outstretched, coming straight for Iris. Griffin fast-draws Serenity as the Wight swings at Iris's face with its claws. The attack misses. Remar says, "With the place not structurally sound, we may want to consider a controlled and guarded retreat and finish him up back there" Remar flicks his eyes to the ceiling. Iris whispers under her breath, "This is not where I wanted to be, this is not where I wanted to be..."
Draven leans toward the wight and yells "back to the flaming pits with you!" As his words echo through the narrow passage, a holy fire bursts from him and engulfs the ancient undead. The creature makes a sickly wheezing sound and stumbles back a step. Remar hurls a magical bolt at Wight's head. The Wight tries to dodge Remar's but this time the bolt finds its mark. Draven readies his mace and Griffin steps forward and finished readying his shield. In a fearful reaction, Iris lashes out with her sword. 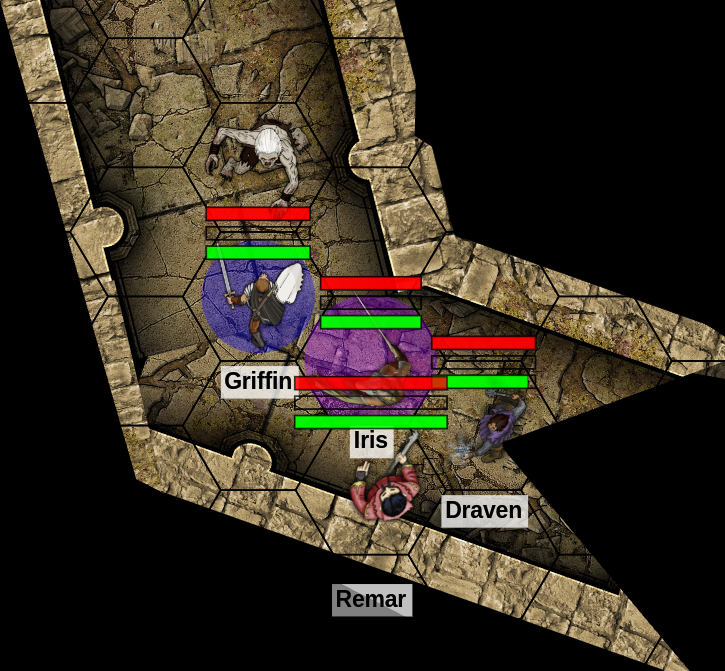 The Wight attempts to dodge Iris's attack but fails! Iris wields her saber like a meat cleaver and the creature goes down under the weight of her chop. It lies on the floor unmoving. Griffin cries out, "You go, girl!" Griffin kneels and picks up the bowl, it is heavy and now dented, but looks whole. Intricate designs can be seen on its surface, inside and out, though the details are obscured due to the thick layer of dust. "Wonder if there's any other long forgotten treasure down that oh so dangerous hallway?" the greedy Wizard wonders. Griffin replies eagerly, "We can look." Draven chides, "Perhaps it would behoove us to participate in the ritual to banish all these undead first?" "Priorities," Iris gasps. Remar stares longingly down the hall.